On the 14th of July 2014 my degree was officially conferred to me at a graduation ceremony at Hull City Hall. The day started off with a lunch inside the computer science department at the university, which was a nice opportunity for my parents and siblings to see the labs in which I’ve done a lot of my work over the past three years. Whilst we were at the lunch I was called up in front of the other students, and their families, to receive the departmental award. The award means that my name will be shown on a golden plaque inside the social area of the department and I will receive £100 from the university. It will be quite cool to have a plaque inside the department, especially as I recognize a lot of the names on the board already as being our current lecturers — my name will be in good company. I received the award for having the highest overall grade of a graduating student — at 86.05%. After lunch my family and I made made our way to the Guildhall in Hull City Centre where I picked up my cap and gown. 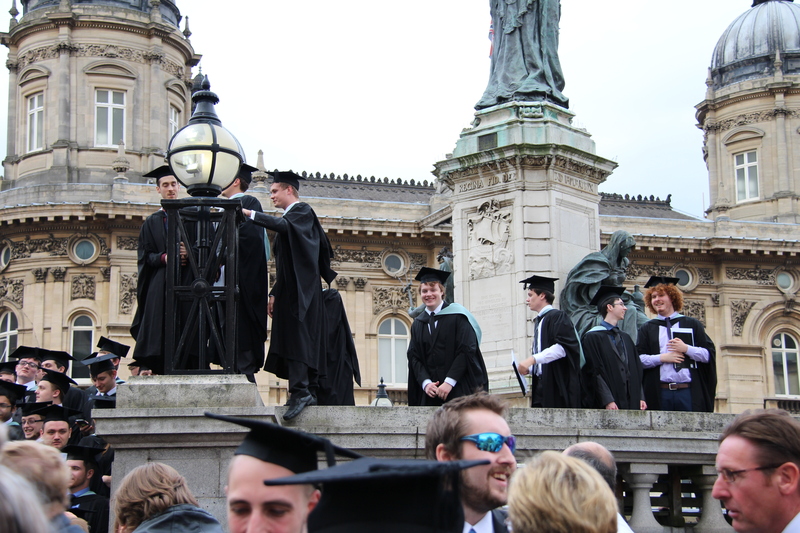 We then made our way to the City Hall where the actual graduation took place. Rob Miles, one of my lecturers from the first two years of my degree, explained how the process of graduating worked. We simply had to walk across a stage after our names had been called and nod at the Chancellor of the University. Behind us were some of the lecturers from Computer Science, Maths & Physics and The Hull York Medical School — all of the departments who had people graduating that day. Once the graduation had taken place inside we went outside for the traditional slate throwing with the town crier. He was rather funny. Once all of the pomp and ceremony was over my family and I went for dinner and then the drinks started flowing with my brother and university friends out in a few pubs in old town, and then the Piper Club on Newland Avenue. 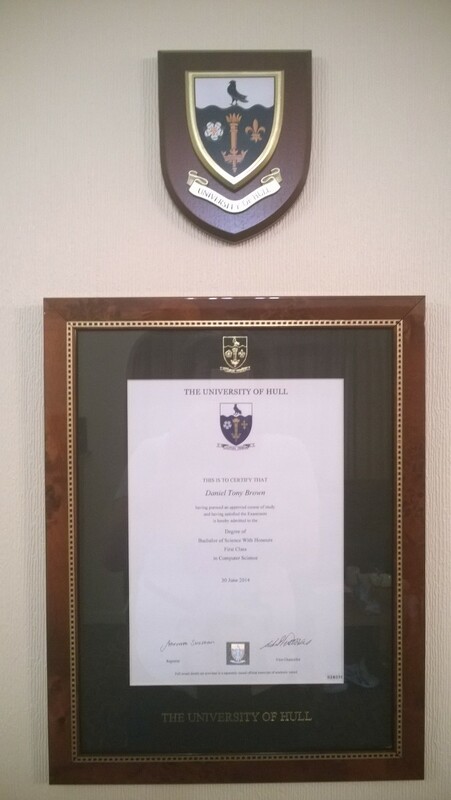 My degree certificate, and shield, on my living room wall. The day after my graduation was my birthday, so its been a truly brilliant few days. Thanks to everyone involved, you know who you are! I’ve certainly had a London-Centric year this year, I’ve been to the capital probably on average 1-2 times a month since January for whatever reasons — from visiting parliament, to then going on the separate big ben tour, to Microsoft Events, to Family days out, to Olympic Games Maker interviews. On Thursday night Europe’s tallest building, The Shard London Bridge, opened for business. To celebrate this achievement there was a light and laser show which illuminated central London. Going was a spur of the moment thing, we hadn’t really planned to until we saw pictures in the newspaper of the rehearsal of the event — which looked amazing. My mum took my brother and I to Stanmore tube station, around 25 minutes drive from our house in Dunstable, and we travelled down the Jubilee line, and then the circle line, to Tower Hill. We then attempted to find a spot on Tower Bridge to view the shard, which is almost certainly one of the most impressive feats of engineering I’ve seen. There was real excitement in the crowd as the time approached quarter past 10 — the time the show was due to start. At exactly that time the entire building, which is HUGE, was illuminated in lights which slowly transitioned between 4 colours: red, white, blue and gold — which in hindsight is probably a nod to the forthcoming Olympic games. Then several lasers came on and every 30 seconds or so changed positions. We eventually realised that each of the lasers pointed at another famous landmark in the capital, for example Tower Bridge and St. Pauls Cathedral, but the lasers did little else. A lot of people, my brother and I included, felt a little mislead by the media. What supposedly happened in the rehearsal — an interesting fast paced light and laser show of impressive proportions — didn’t happen on the night. There was very little laser or light movement, no accompanying music and the whole event was… static. can’t believe the media videos showed massive lasers…so it was CGI? proves they mislead us all. I was on London Bridge and this laser show was poor. What a let down. what a joke. the PR people behind this stunt should be ashamed. It was great that I can say I was at the opening of the tallest building in Europe, and it was a genuinely good night out. The Show was just a dissapointment compared to what was promised. I still enjoyed my night out though. Earlier in the holidays I posted a blog post about what I was intending to get up to. One of the things I needed to get round to doing was fixing my brothers website, Worldwide Lighthouses. After a data loss last year and a loss of back-ups we had to start from scratch, many of the features that users — and my brother — loved on the site we’re lost as was most of the actual content. Now, things are back on track. I’ve spent a portion of the last week or so fixing issues with the Custom-built content management system and now, finally Michael can upload information about Lighthouses outside of England and users can view them. I’ve also stopped most of the deadlinks returning 404’s and instead they now show a coming soon message, which is slightly better for SEO in the long run. I’m currently working on the module of the CMS which works on Lightships, after that will come fog signals, daymarks and finally the glossary. Another project I wrote about was 5Hives, a website for a local bee keeper who wants to start his online presence in an affordable manner, but be able to update his website with new products and information without the need to constantly refer back to his webmaster. This is therefore the second Custom Content Management System I’ve created this week. It’s not the best-looking website in the world at the moment, but the basic Database input and output works. I’m gonna put all my effort into making it pretty over the next week whilst we wait for the http://www.5hives.co.uk domain to transfer from 123-reg to Fatcow hosting. Over the holidays I’ve been rewriting sweepy cleaner, its been going well and my code is now much more tidy, more managable and easier to understand, all of which are good things! Today, thanks to Mr Shane Gravestock, I added in a game sound track — to accompany the menu sound track — as well as a new sound effect for when the hoover dies — i.e. when you hit some furniture or the sides of the screen. I’m going to upload a pre-release version of Sweepy Cleaner to the marketplace tonight, come back here to get the URL to be able to download and play it later. I’ve been working hard on my other projects, but I’ve still made time for the metablogger app. I now have a fairly solid user-interface. I hope to have the app complete and submitted to the Windows Phone Marketplace sometime next week.